This post brought to you by Cricut. Yesterday I shared the BEFORE photos of my daughters room. Today I get to finally share with you the after – which is my project submission for the finals of the Cricut Design Space Star Challenge! I ended up going with a Mermaid theme instead of The Little Mermaid… which I think surprised Olivia at first. 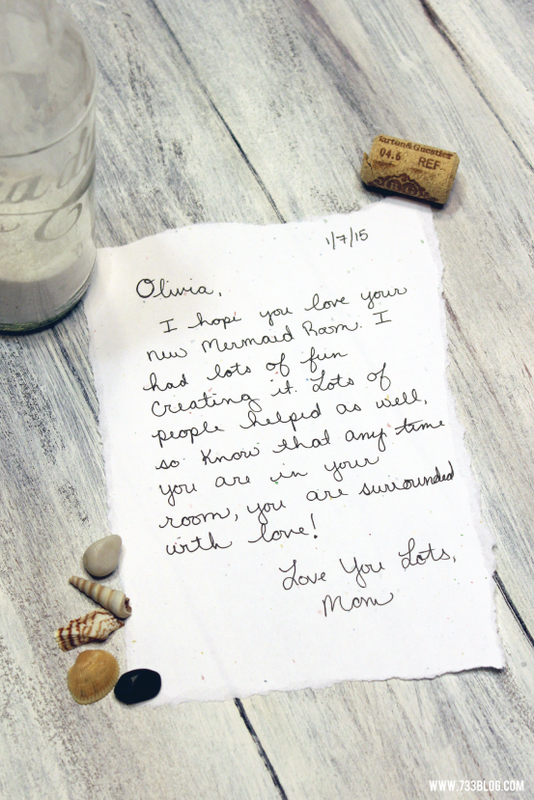 She had asked for her room to be a surprise, but she still had little clues as to what it would be and had guessed Little Mermaid. I think she was expecting to walk in and see all things Ariel and Melody. But I’d rather have an item, like a picture, that can be easily switched out then splattering a character all over the room. 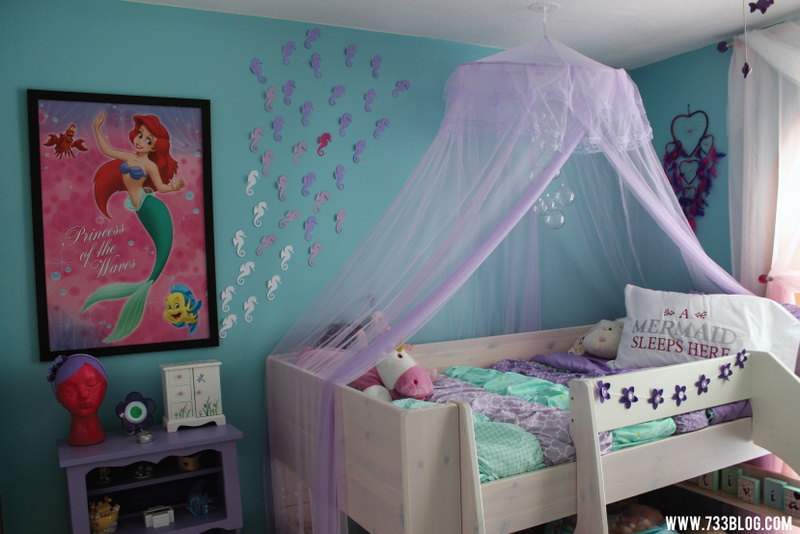 That being said, this is an truly an Under the Sea themed room with a nice sprinkling of mermaids, all that can grow with Olivia! The bed had to stay in the same place because of the layout of the room, but I still think the changes have a huge impact! I’ll share more details from some of the projects throughout the next week, but if you have any questions, feel free to ask in the comments! Alright, let’s look at all the pretty pictures! Cricut Explore Project #2: DIY Felt Flower Bunting — Update: Flower Bunting Tutorial is now live! The DIY Bubble Chandelier is a fav that was made with clear plastic Christmas ornaments and fishing line. UPDATE: DIY Bubble Chandelier tutorial is now live. 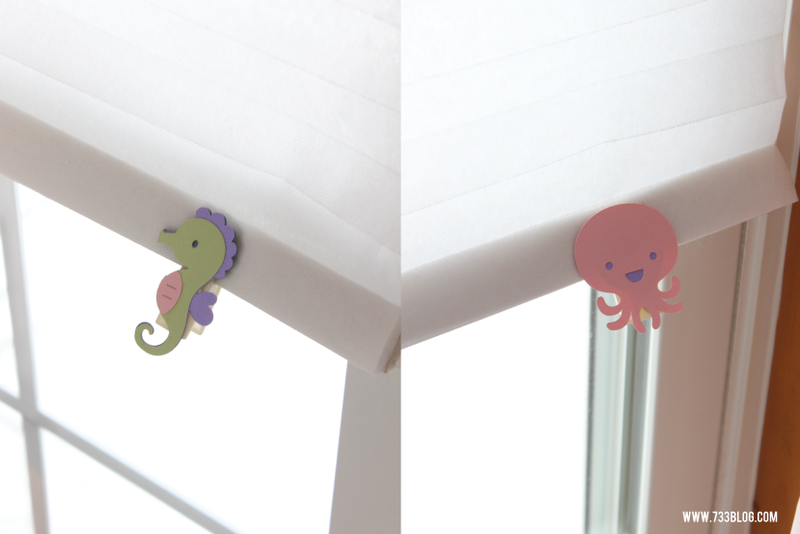 I am so happy with the DIY Clay Whale Knobs too – the duo always makes me smile. Update: The Clay Knob Tutorial is now live. 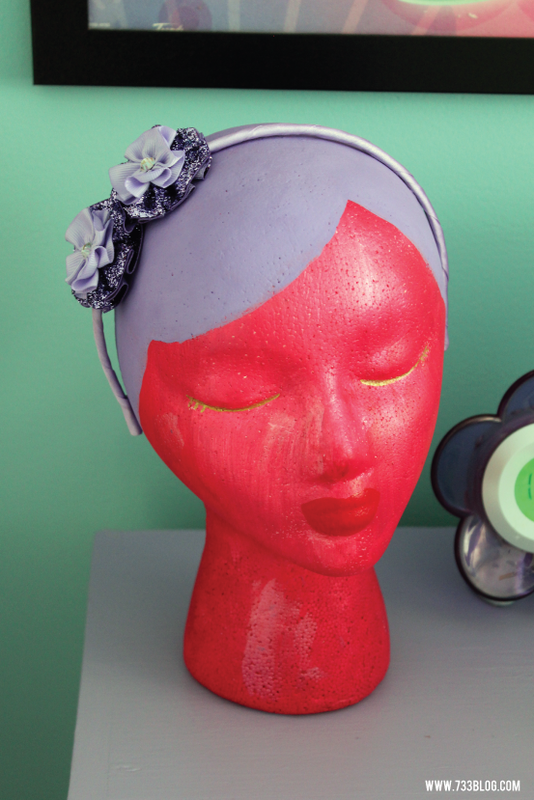 This foam head headband holder was Olivia’s creation. I have a box of foam heads left over from my FloraCraft challenge. She was looking for a craft project to do and asked me if she could paint one. I said yes and this is the result! She chose the colors and even though I recommended just painting it one color and not doing hair, she was bound and determined to do it her way and she was so right! She did this with very little help from me and I love the result. So proud of my crafty girl! The closet is one of the projects I am most excited for! The BEFORE of the closet was such an embarrassment. It was not utilizing the space well and I was constantly shoving stuff inside. Now I have a spot for everything – the top three bins hold clothes that have been handed down to Olivia, but are still too big. The other two bins hold clothes that are too small and we willl be handing down. The Elfa drawers from The Container Store are AMAZING (I love them so much I ended up buying a set for my sons closet too!)! I used them to replace her dresser, which gives her more space in the room. They hold all of her clothes perfectly and are easy to access. The labels help her (and my hubby) when putting clothes away. Have a non-reader? Consider adding pictures of the contents instead of words! 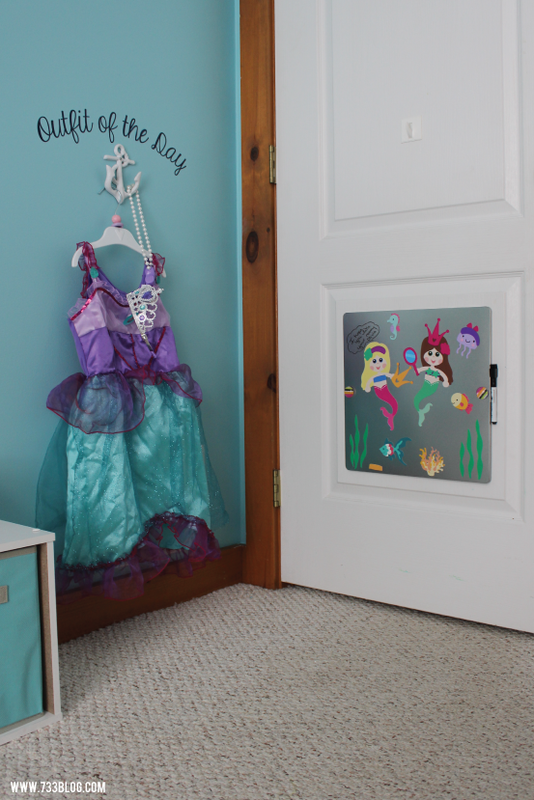 Cricut Explore Project #7 & #8: Outfit of the Day vinyl and Magnetic Mermaid Board — Update: Magnetic Busy Board Tutorial is now live. I placed the magnetic board on velcro 3M Command strips so she can take if off the door and use it on trips, etc. This is by far her favorite part of the room! She has used this for hours already – she loves playing with the Mermaid dolls that I designed and is constantly making them sing by writing words in bubbles next to them! She has also really come to love the Outfit of the Day station. She likes me to help pick her outfit but she wants to hang it on the hook all by herself. I use to lay her clothes out on the floor the night before, this is just a much cuter version of that! The DIY Faux Capiz Shell Chandeliers were left over from Olivia’s 4th Birthday Party that I had hung in her room and looked too perfect in the space to take out! 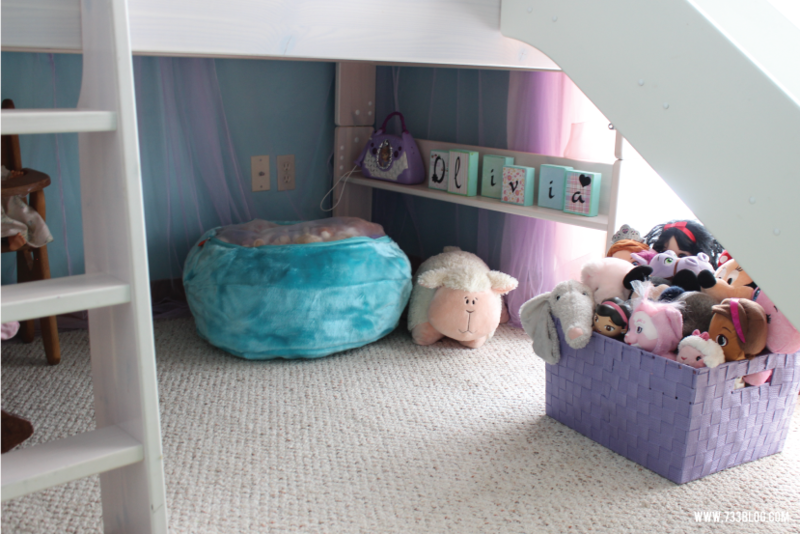 Storage was lacking in Olivia’s room before so I made sure that she had PLENTY this time around. Each of the bins is labeled, Barbies, Drawing Supplies, Electronics, Baby Doll Stuff, Small Toys – that way everything has a place and it is easy to clean up and store items. 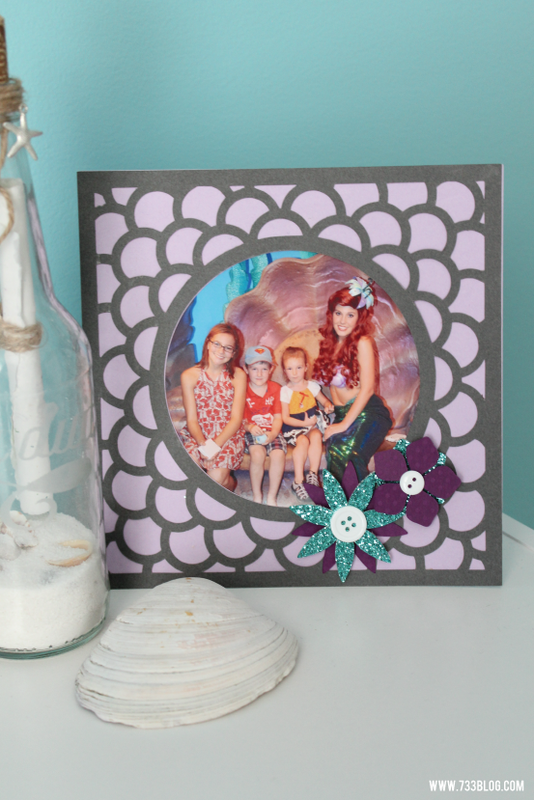 Update: The Sea Shell Mirror Tutorial is now live! 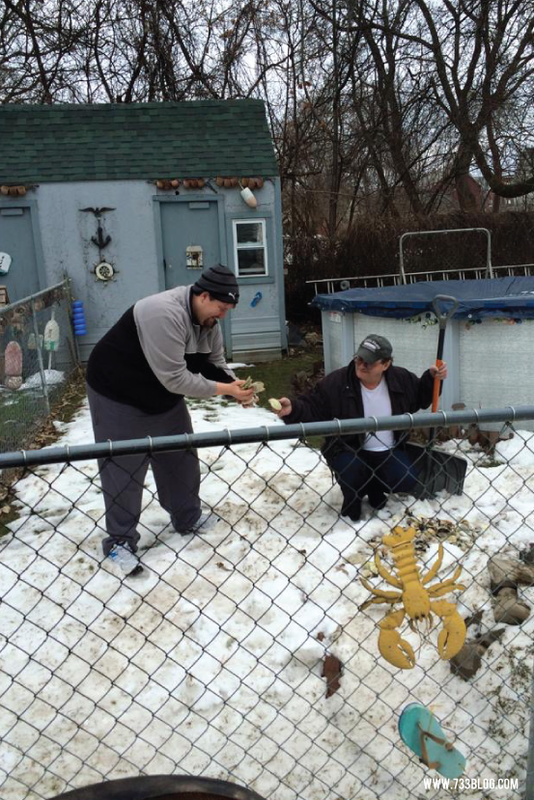 I must give a shout-out to my friend Jeremy and his in-laws, Jeff and Winona – they literally dug through the snow in the backyard of Jeff and Winona’s house to gather the sea shells for the mirror for me! They have a whole collection in their garden from all of their trips to North Carolina! Cricut Explore Project #14: Glass Etched Message in a Bottle – the etching says “Dia Duit” which is Hello in Gaelic. 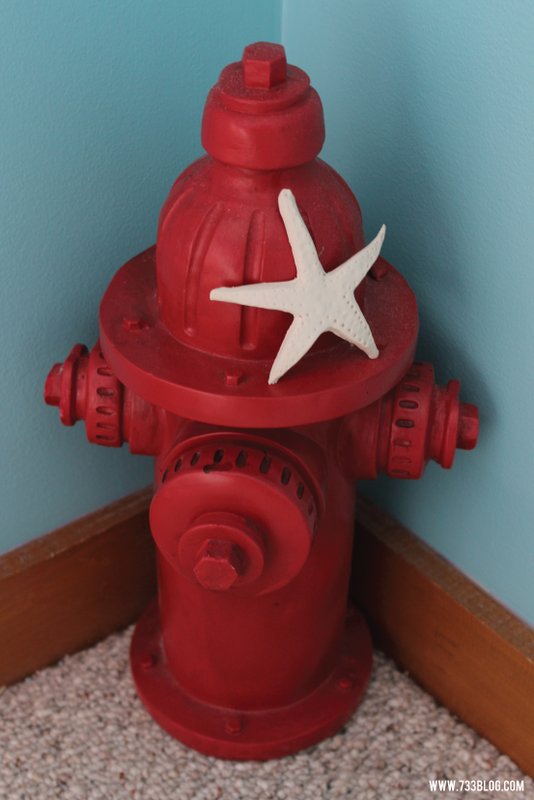 The fire hydrant also made it back into the room with a little DIY clay starfish calling it home. 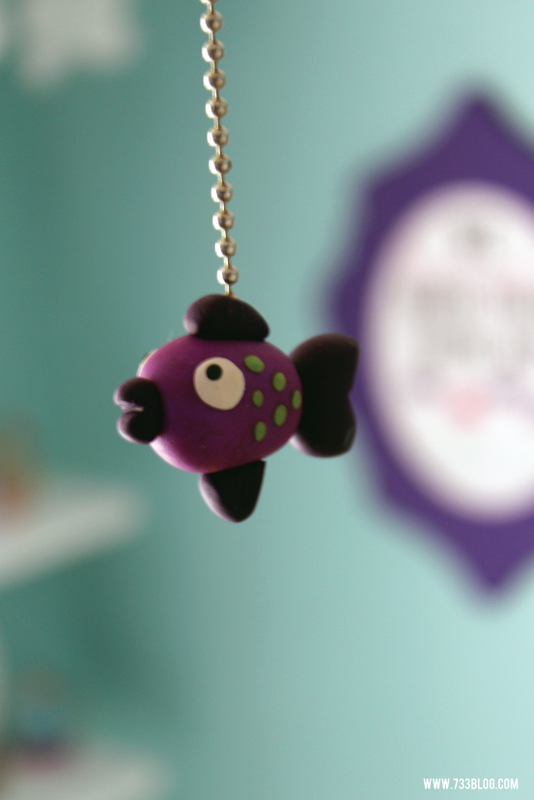 I love my little DIY Clay Fish Fan Pull! It looks like him and his brother are swimming in the middle of the room! This is what I did with all of her stuffed animals! The soft ones and ones she doesn’t play with as much got placed in that awesome Stuffed Animal Bag from Boon that doubles as a floor pouf! She can still easily get to the animals inside by unzipping the mesh top. My son doesn’t think it is too comfortable to lay on, but we’ve used it several times and it works perfectly. You can just sprawl like a regular bean bag, but Olivia uses it to sit and do her hair or to play with her magnetic board. I think it is way fun! The stuffed toys that had hard plastic or that she plays with regularly were placed inside the purple basket for easy access. 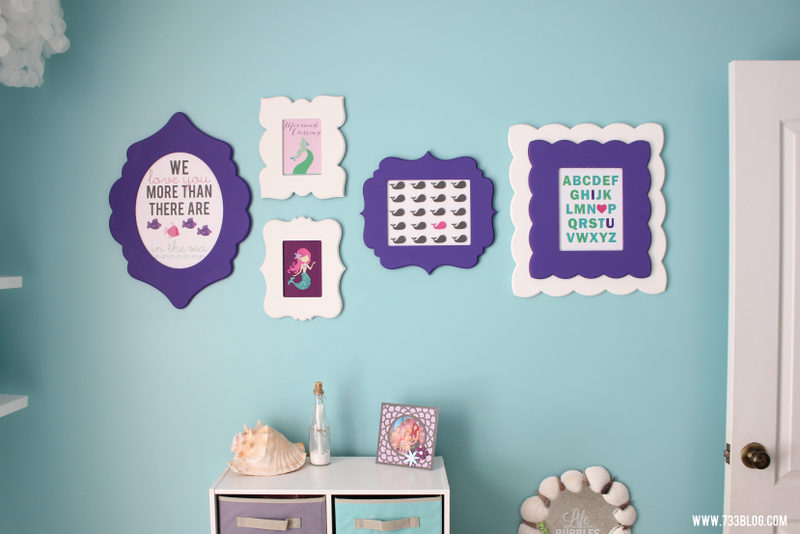 The Olivia name blocks were one of my very first Cricut projects I ever made, 5 years ago! I had a small Cricut machine that cut 6″x12″… the Cricut cutting machines have come a long way since then. As a reminder I had a Cricut budget of $1,000 for the room makeover. 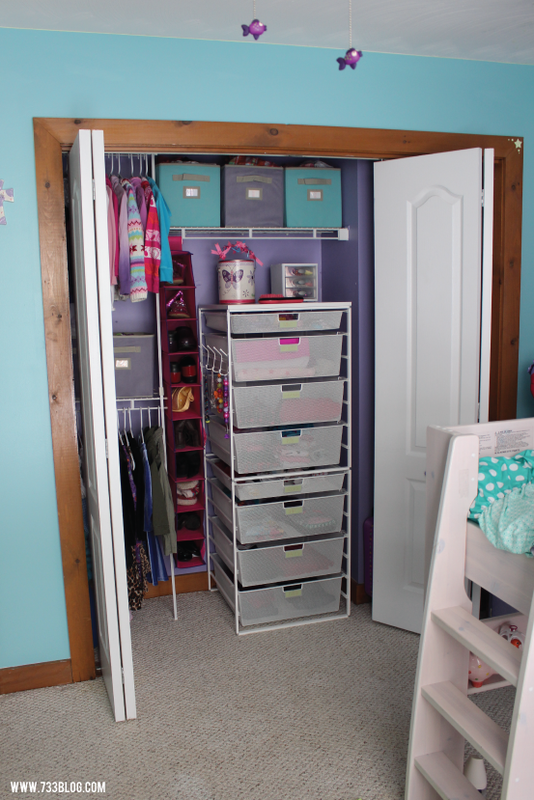 Normally I don’t spend that much on changing things up in my kids room, but since I had the money, I decided to splurge on a few things, especially to make the closet work better for our needs! What did Olivia think of her surprise? She was a bit overwhelmed at first. There was a lot of change and a lot to take in! She isn’t one to jump up and down or cry… she absorbs. And then for the rest of the night I heard over and over how much she loves me, she loves her new room, did I see this and how cool is that?!? It was enough to make my heart burst. She was so appreciative and really took in each and every detail of the room. I had so much fun putting this room together. I had some friends that really took the time to help (thanks Jeremy & Krista!) and were awesome sounding boards. We had some really fun text convos throughout the designing process and they made the whole experience that much more fun! 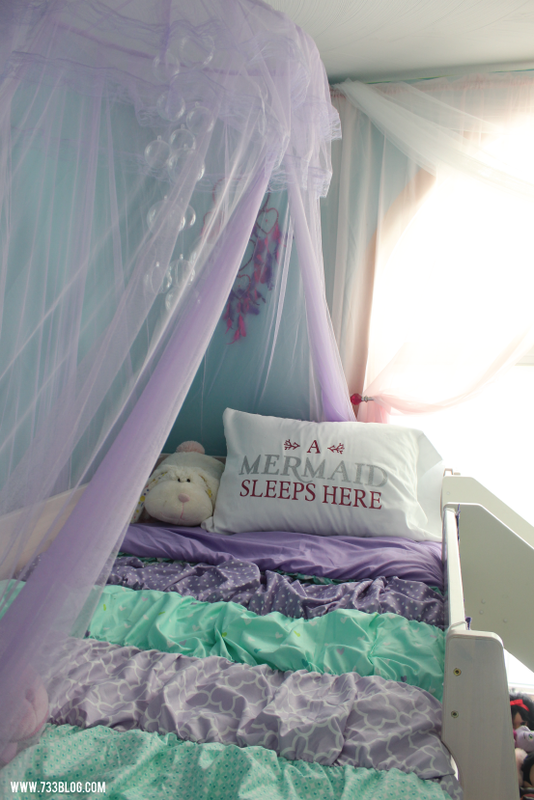 I sure hope you like the end result and I would love for you to vote for my Mermaid Room next week! Absolutely PERFECT!!! It’s like straight out of a magazine. I love it. Thank you so much Kim! Interior Design isn’t my strongest suit by any stetch, but when it’s for kids I find it TONS easier. 🙂 It was definitely nice having a budget that made playing with different things fun! Kim this room turned out so adorable!! 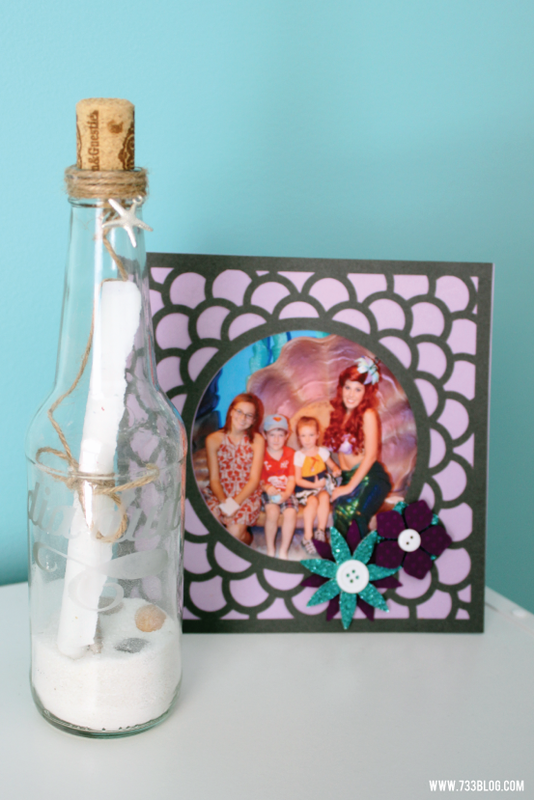 Love all the mermaid accents! I love how everything turned out. Great details! Where did you get the bed? I love it because it doesn’t look too high and there’s enough room to play below. Kudos for a wonderful job!! It turned out SO awesome Kim!! I love all of the little details – especially the DIY polymer clay pieces!! The bubble chandalier is brilliant too. Nice work girl! This turned out SO cute! I’m in love with the bubble chandelier over the bed! Great job! Awww! Thank you so much for your kind words. Hi Kim, I love what you did with your daughter’s room. ADORABLE. I have a question where did you get the bed? My lil’ one loved it. Hi Irene! Thank you for the kind words. The bed is the Popsicle Loft Bed. We got it off Overstock.com several years ago. 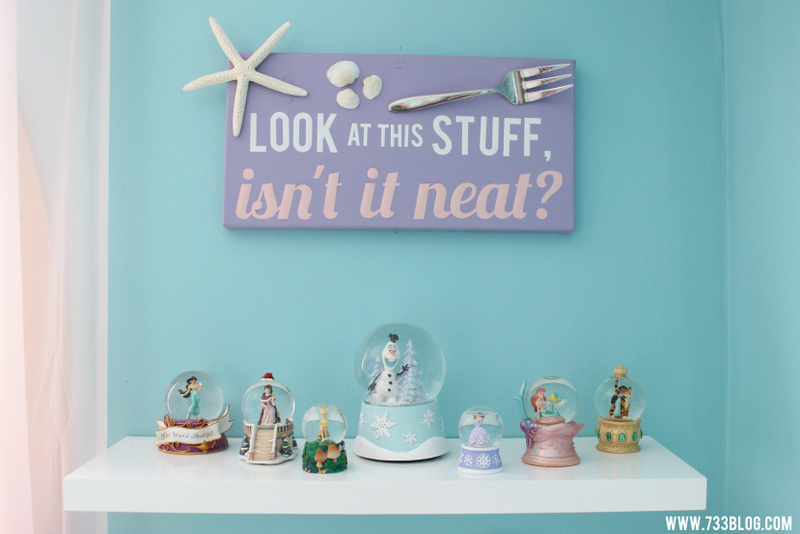 I love the look at this stuff isn’t it neat sign! So cute! THis room is simply magical! LOVE LOVE LOVE it! Thank you so much! I really enjoyed putting it together for my girl. I am in love with this room! I really hope you go through and show how you did something’s. Especially all the clay stuff! I have tons of clay and haven’t used it in ages. Would love a close up photo and then how you made them?! This is truly a magical room with just the right amount of accessories! I’m sure you and your daughter will have many happy memories here. The wall paint is the perfect backdrop, too. May I ask what brand and color you used? I love all of the mermaid accents! Beautiful room! This is amazing!! I think the bubble chandelier might be my favorite part, but it’s so hard to choose! Gorgeous!! So cute! I voted . . . and I love the chandelier! Thanks so much Amy! I appreciate it! This is such a beautiful and creative room. I love it!! Ariel was always my favorite. 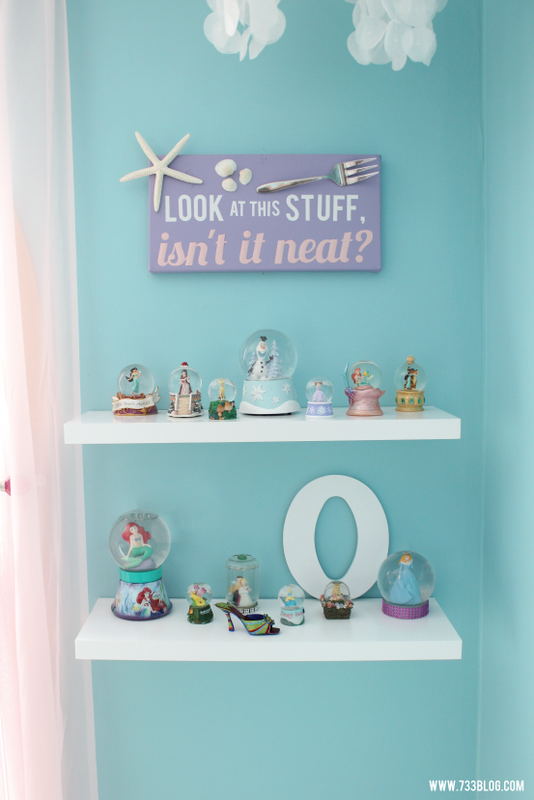 I would love to do this for my daughter’s room one day. She was always my favorite too, so I’m not real surprised that BOTH my girls are Mermaid fans. 😉 Thanks for your sweet words! 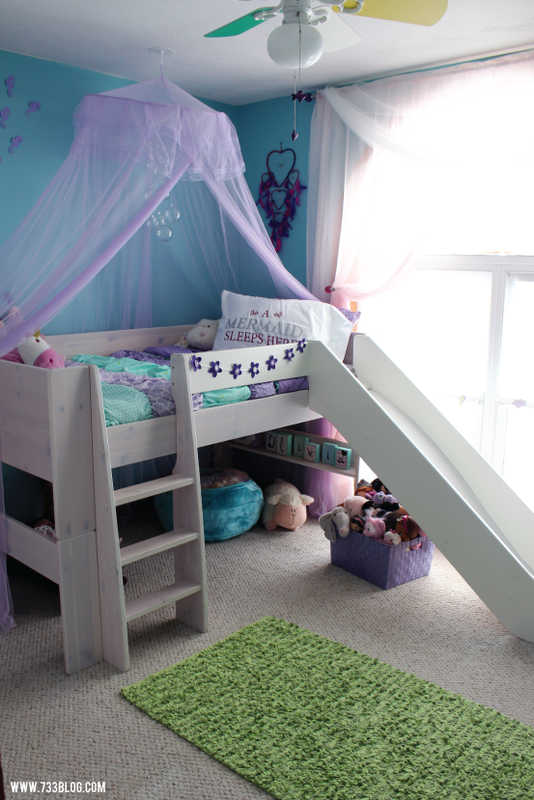 Kim – what a lovely room you created for your little girl. She will always have sweet dreams there! Thanks for sharing. 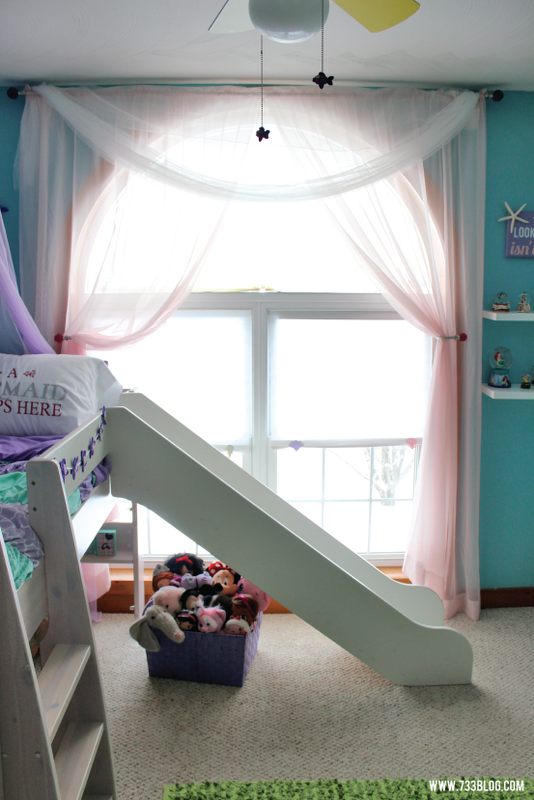 Such a cute room for a little girl. Love all the details! I like how you didn’t go with character themed everything. That way many elements of the room can grow with her and be used up until high school. I can’t make one exactly the same, but we agreed to use some of your ideas for her bedroom. Can you tell me which font you use for the “Outfit of the Day” vinyl? I tested this text with several similar fonts but none of them look as pretty as yours… yours is perfect! Thank You so much for sharing your ideas with us! I’m so glad you and your daughter were so inspired! The font is KG Eyes Wide Open. I would love to see your room once the transformation is complete! When it’s done I’ll show you for sure! What size is the canvas? Just a rough estimate would be good to know. Thanks! I love this room! 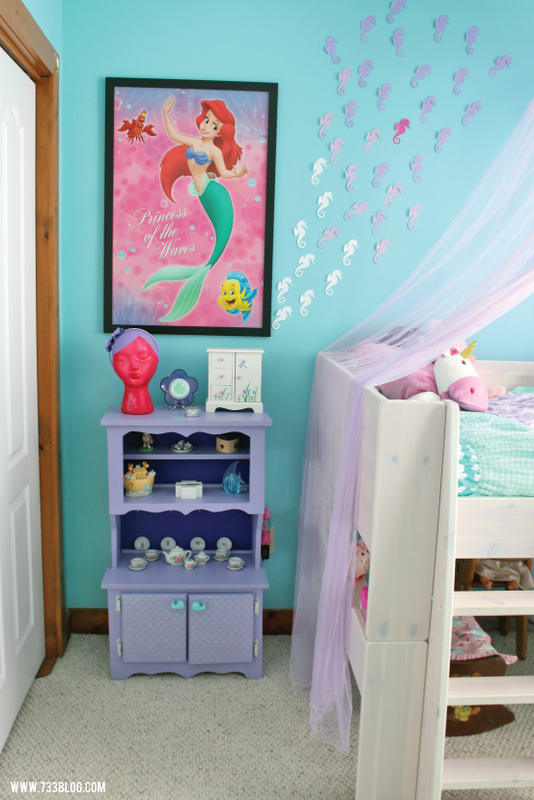 I am working on a mermaid room for my twin girls and love your ideas here. Where did you get the iron on letters and what size did you use? I love the pillowcase and was hoping to try it myself! I used my Cricut Explore to cut the letters out of iron-on vinyl. I love this room! I am currently doing my daughter’s room over into a mermaid theme. And my son’s a firefighter theme. Where did you get that fire hydrant? This room is awesome! Nice job! Thank you! The fire hydrant was a gift from a friend. She found it at a store called The Christmas Tree Shoppe. I absolutely love this room!! I love the colors and my daughters favorite color is purple!! I especially love the bed spread, I have to ask where u got it from!! Great job!!!! Thank you! Bedding came from Target. Hi Kim! I was wondering if there is another place I can find that bedding? It is no longer in Target ???? what paint color did you use? and is there a tutorial for the bubble chandelier? The Blue is from Home Depot – Behr Ultra Satin – Base is 7754 – 510D4 Embellished Blue. The Purple is from Lowe’s – Valspar Signature in Satin – they based the color off from a picture I had and in their computer it is 1405 Snugglepuss. There isn’t a tutorial for the bubble chandelier, but you’re not the first person to ask, so I’m planning on putting one together soon! Love this room…..where did you get the bedding? Where did u get the picture frame? I love this! My daughter now wants her room just like it! Where did you get the purple canopy for the bubble chandelier? Thank you! I found the canopy on Amazon for $13! This is absolutely adorable. 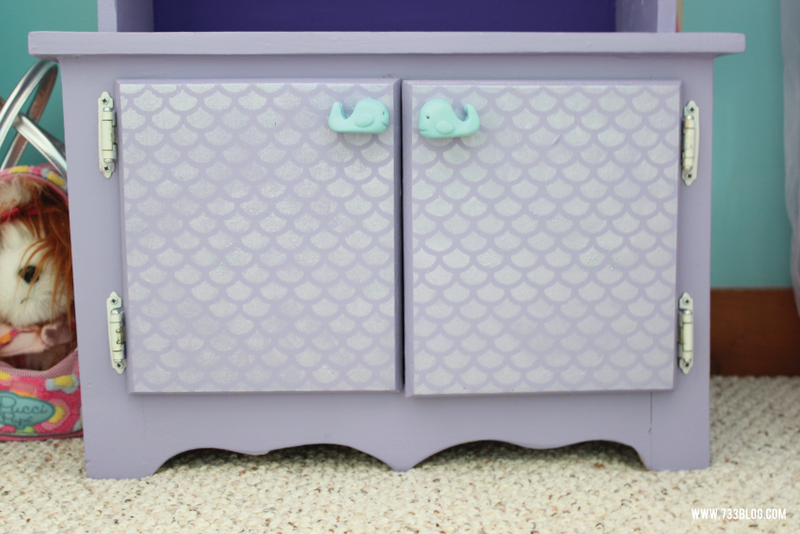 I wanted to let you know that I am featuring this on my site at http://www.simplycreativemoms.com/girls-bedrooms.html if you don’t mind. Can you tell me where you got the bed from? The bed came from Overstock.com several years ago.